Chief of Jamat Ud Dawa Hafiz Muhammad Saeed has admired China's role on Kashmir Issue. Hafiz Saeed said on Sunday Issue of Visas on White Paper for people of Occupied Kashmir by China is a very good step and we see China's Steps on Kashmir with respectable eyes. He said Muslim Rulers must learn lesson from China to Save Kashmiris from Indian Terrorism and Brutality. 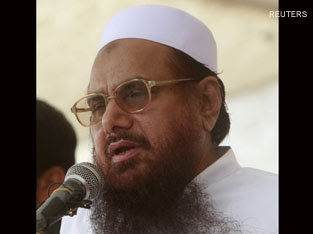 Hafiz Saeed said that Peace in Whole region of South Asia is connected with the Kashmir Issue and there can't be any peace until Indian Army is present In Occupied Kashmir to stop Kashmiris from their right of Freedom. Jamat Ud Dawa Chief also said that India will have to run away from Kashmir very soon.